A simple and efficient one-pot procedure that enables rapid access to orthogonally protected N,N′-diaminoalkylated basic amino acid building blocks fully compatible with standard Boc and Fmoc solid-phase peptide synthesis is reported. Described synthetic approach includes double reductive alkylation of N α-protected diamino acids with N-protected amino aldehydes in the presence of sodium cyanoborohydride. This approach allows preparation of symmetrical, as well as unsymmetrical, basic amino acid derivatives with branched side-chains that can be further modified, enhancing their synthetic utility. The suitability of the synthesized branched basic amino acid building blocks for use in standard solid-phase peptide synthesis has been demonstrated by synthesis of an indolicidin analogue in which the lysine residue was substituted with the synthetic derivative N α -(9H-fluorenyl-9-methoxycarbonyl)-N β ,N β ′-bis[2-(tert-butoxycarbonylamino)ethyl]-l-2,3-diaminopropionic acid. This substitution resulted in an analogue with more ordered secondary structure in 2,2,2-trifluoroethanol and enhanced antibacterial activity without altering hemolytic activity. The online version of this article (doi: 10.1007/s00726-012-1336-5) contains supplementary material, which is available to authorized users. 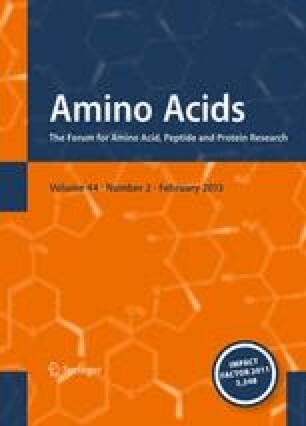 We acknowledge support of the N,N′-diaminoalkylated basic amino acid building blocks work described herein by the Torrey Pines Institute for Molecular Studies (TPIMS) start-up fund to P.C. We are especially thankful to Dr. Stanislaw F. Wnuk and Yong Liang from Florida International University for their assistance with NMR experiments. Also, we thank our colleague Dr. Mare Cudic for helpful comments and Ms. Karen Gottwald for editing the text.